I guess this was apparent a while ago, but now it is mathematically in the books: the Marlins have been eliminated from the National League East division race. And in the wild card standings, Florida is as far out as you can imagine. Without the dismal months of June and August, though, they would still be right in the thick of playoff talk. April was a great month for the Fish, they started the year 12-6, matching the best 18-game start in franchise history. The team finished the month 16-9, just 1.5 games out of first place. April was full of highlights for the team: Josh Johnson looked like the NL Cy Young winner, Anibal Sanchez had an 8 inning no-hitter that turned into a complete game one-hitter (Sanchez and Johnson made their presence known in my no-hit bid log), and Edwin Rodriguez looked like the Miami Marlins’ 2012 manager. The Fish went 5-23 in June. That was the story. Edwin Rodriguez resigned, and 80 year-old Jack McKeon took over as manager. The Marlins played a home series in Seattle (which may have actually been a more comfortable stadium for the team to play in), and the only bright spot was Mike Stanton. If you ever go to a Marlins game, don’t miss a Mike Stanton at-bat because you never know when he will unload on a 450-foot home run. July was surprisingly decent for Florida despite it coming off the worst month in the team’s history. The Marlins finished July just two games under .500 after going 17-10 in the month. Leo Nunez reached 30 saves on the last day of the month. On the same day, Emilio Bonifacio hit his second home run of the year; it was just the second time he had ever hit a ball out of a major league park. But August brought back memories of June for the Marlins. They went 7-20 on the month. Again, Mike Stanton got the Marlins in the news somewhat frequently, but instability in the pitching rotation and starting lineup plagued the Fish. Once the league leader, Leo Nunez had just 3 saves in August. If the baseball season consisted of just April, May, and July, the Marlins would be 16 games above .500 at 48-32. But the 162-game season requires each team to play every out of every game, and the Marlins just didn’t have it this year. Now that it is established that Florida will not win the NL East for the 19th straight year, and barring an absolute miracle will not make the playoffs, they are now the Miami Marlins to me. A fresh start, a fresh stadium, a fresh name, and a fresh manager are what this team needs to get off the ground with their core group of players. If the Miami Marlins are smart this offseason, they can certainly be in the thick of the playoff race this time next year. 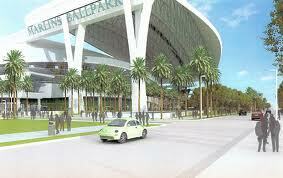 Is there a definitive date for the opening of the new Miami Marlins stadium? I surely want to be at the opening game! The 2012 schedule should be released soon after the end of the playoffs this fall. I believe at that point single game tickets for next season will be available.